"Tokyo is now a next-door neighbor-thanks to the magic of short-waves." 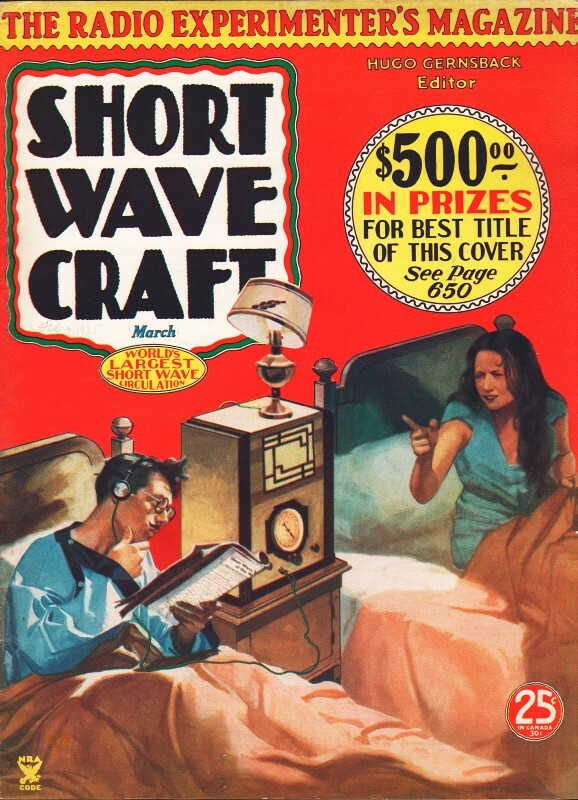 That statement was made in a 1935 edition of Short Wave Craft magazine after the American Telephone and Telegraph (AT&T) company completed its wireless phone (voice) link between the U.S. and Japan; which is the first 'T' in AT&T. Most people today would probably have a hard time guessing that the second 'T' in AT&T stands for 'telegraph.' Its surprising that the name has not been changed to reflect the outdated-ness. Western Union sent its final telegraph in 2006. Another news headline a couple years ago reported on India sending its final official telegraph message. The drawing above shows graphically the important links in the short-wave and wire telephone system recently opened by the A.T. & T. Company between Japan and America. The voices are "scrambled" to insure privacy. A few weeks ago the newest link in the combined wire and short-wave telephone service to foreign countries was officially opened by the American Telephone and Telegraph Company. 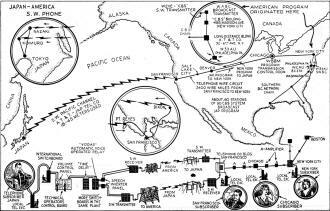 This service involves a short-wave transmission link across the Pacific Ocean from San Francisco to Tokyo, a distance of 5,130 miles, or about 9,000 miles, by wire and short wave from Tokyo to New York. One of the S.W. transmitting units at Nazaki, Japan, is used for regular S.W. broadcasting daily. Tokyo is now a next-door neighbor-thanks to the magic of short-waves. A few weeks ago the new Japanese short-wave telephone service with America was officially opened, officials in both Japan and the United States participating in the inaugural ceremonies. This newest link in the widespread short-wave-wire telephone connections of the A.T.&T. Company to foreign countries, bridges a distance of 5,130 miles across the Pacific. The subscriber's telephone conversations travel on wavelengths varying between 18 and 45 meters, the frequency depending upon the transmission conditions and the season of the year, the extent of daylight over the Pacific, etc. Fig. 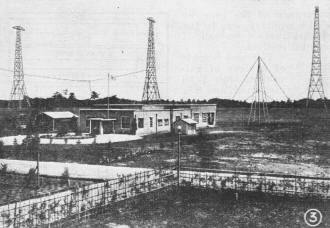 1 shows elaborate short-wave receivers at the Japanese station located at Komuro. Here the short-wave telephone signals from the San Francisco transmitter are tuned in. Japanese technical operators are in charge and one American engineer cooperated with them in establishing the new short-wave telephone transpacific stations. Fig. 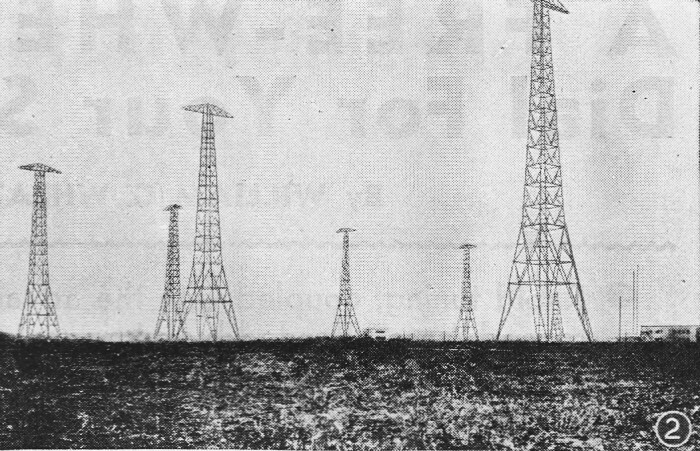 2 shows the 280-foot steel towers supporting the antenna array at the short-wave transmitting station located at Nazaki, Japan. Building, at right, houses 20 kw. transmitter. Fig. 3 Here we have an interesting view of the building housing the receivers and auxiliary equipment for the short-wave phone service to America and located at Komuro, Japan. The antenna arrangement is supported by the masts shown, which are somewhat lower than those used for supporting the transmitting aerials. Fig. 4 shows Japanese engineer tuning one of the 20 kw. 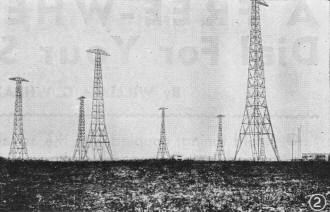 short-wave phone transmitters at Nazaki. Fig. 5 shows rear view of one of the transmitters at Dixon, California. Beginning at right, we have R.F. 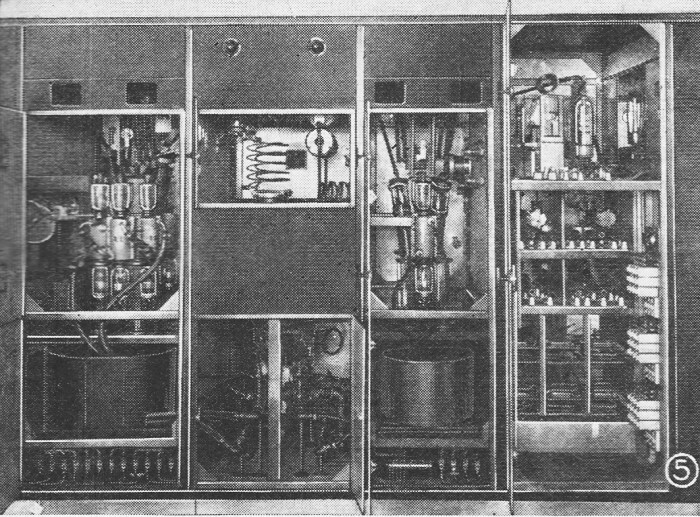 input apparatus; first amplifier stage; inter-stage unit showing tuned circuit and water flow alarms; water cooled vacuum tubes for second stage of amplification. Dixon, California, (transmitting station) line terminal equipment in copper-shielded room. Japanese engineers, many of them educated in American universities, are in charge of the 20 K.W. Japanese transmitter located near Tokyo, at Nazaki. An engineer of the Bell Telephone Laboratories, George W. Gilman, has spent considerable time in Japan with their engineers and his wife helped .the twenty-two Japanese operators to perfect the English they are now using in dealing with their American sisters in San Francisco. The San Francisco girl operators have only to speak English therefore in setting up subscribers' calls. The Japanese trans-Pacific receiving station is located at Komuro, a short distance from Tokyo, both the transmitting and the receiving stations being connected, of course, by telephone lines with Tokyo. By means of this new short-wave radio telephone service, Bell and Bell-connecting telephone subscribers in the United States, Canada, Cuba, and Mexico, can now be interconnected with telephone subscribers in Honshu, the principal Island of the Japanese Archipelago and in places on other islands of the group. This is the fourth radio telephone circuit to be set up connecting Bell System subscribers with countries on the other side of the Pacific, the other short-wave phone channels spreading out over the broad Pacific connecting with Honolulu, in the Hawaiian Islands; Java and Manila in the Philippine Islands. The short-wave messages from Japan are picked up at the special American Telephone and Telegraph Co.'s receiving station, located at Point Reyes, near San Francisco, the outgoing phone messages passing through the twenty K.W. transmitter located at Dixon, a short distance from San Francisco. 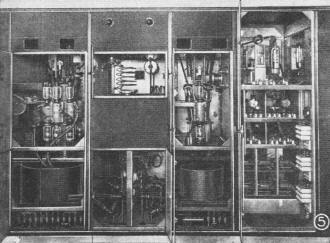 The subscribers' telephone voice currents in either direction are passed through speech inverters, which "scramble" the words or rather syllables, turning them into unintelligible jargon for their flight through the ether. As the accompanying diagram shows, the route of the Japanese subscriber's voice, when the connection with America is established, is as follows: The voice currents pass over the subscriber's telephone to his local telephone exchange, and then to the international operator in Tokyo. From there the voice passes through the technical operator's control board, then through a volume control panel, a "time delay" network, then through a voice-operated relay or "Vodas", and from this point the outgoing speech to America passes through "speech-inverter apparatus." Next it passes to the transmitting station where it modulates the carrier, continues to the antenna and is sent winging its way 5,130 miles across the vast Pacific to the receiving station at Point Reyes, Calif.
Let us follow the path of the incoming phone talk from Japan; after it has been received at Point Reyes, it is transmitted over a wire telephone circuit to the Telephone Building in San Francisco. From this point the telephone currents pass out over regular telephone circuits to the town or city of the United States, Canada, Cuba, or Mexico, to which the connection is made. If the conversation is with a telephone subscriber in San Francisco, he talks through his local switchboard, which in turn connects with the overseas operator's switchboard and thence with the overseas technical control board, both of which are in the Telephone Company building in San Francisco. If the American telephone subscriber is at a point other than San Francisco, then the voice currents are suitably amplified by the vacuum tube repeater stations located at regular intervals along the telephone line to the cities concerned. These repeaters or amplifiers are usually located in telephone exchange buildings in the various cities. 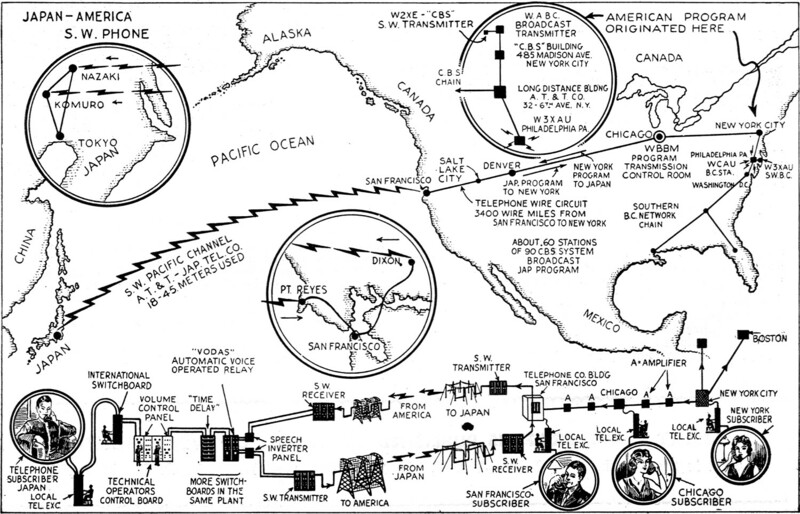 The route of the telephone conversation from a point in America to Japan is interesting: It passes over the usual telephone circuit to Frisco, being suitably amplified at regular intervals along the wire line as required. 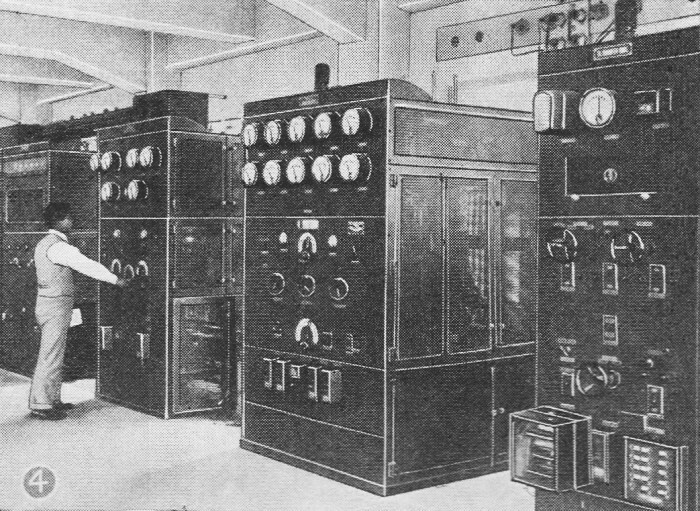 The voice passes through the technical operator's control board in San Francisco and then passes on to the short-wave transmitter located at Dixon, where it is radiated in the form of short waves, 18 to 45 meters in length, depending on the season and the time of day, etc., on its way to Japan. Of particular interest to our readers was the entertaining program recently broadcast from Japan over the Columbia Broadcasting System. Those in this country who heard it were undoubtedly astonished at the clearness of the voices and music from Japan. They sounded just like those from a local station. Incidentally, one of the short-wave transmitters located at Nazaki is used by the Japanese for broadcasting regular short-wave programs at a certain time each day. When WABC and about 60 other broadcast stations of the 90 stations in the CBS System broadcast the program from Japan at 5 p.m. on Dec. 8 (it was then 7 a.m. in the morning of the next day in Japan) the incoming music and voice currents from Japan came over the Transcontinental telephone line through San Francisco, Denver to Chicago. Here it was fed to station WBBM the CBS broadcast station located at Chicago, and thence to other stations connected to the telephone lines constituting the Columbia network, which broadcast the program to and from Japan. The program from America, comprising music and a talk, originated in the Columbia Studios at 485 Madison Avenue, New York City. 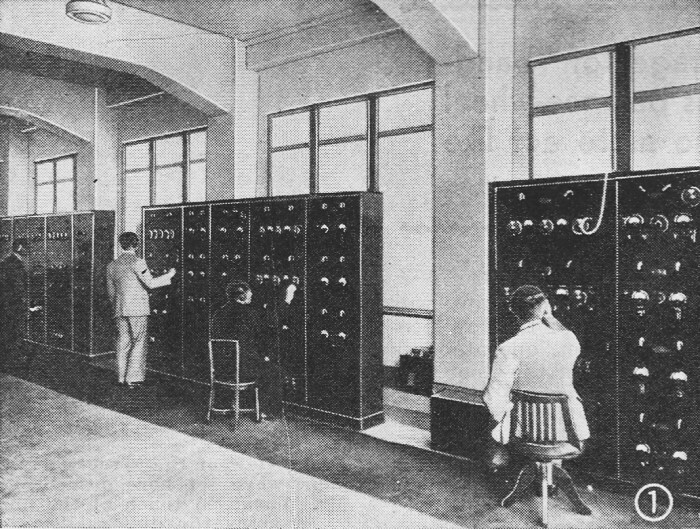 It is interesting to note that the main control boards for the Columbia as well as the NBC network, are located in the "Long Distance" building at 32 Sixth Avenue, these switch boards being under the supervision of the experts of the "Long Lines Department" of the A.T.&T. Company. 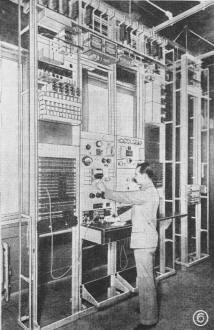 When the program from Japan was heard by American listeners on the date mentioned, the incoming voice and music was received at the control board of the Telephone Company at Chicago; thence it passed over a private telephone (leased) line to Station WBBM and simultaneously over the telephone lines that form the Columbia network. It is interesting to note that, at this point, two rebroadcasts concurred on short waves, one from W2XE, the short-wave transmitter associated with WABC, and the short-wave transmitter W3AU, associated with the Philadelphia CBS Station WCAU.